The crisis in Flint is real. Half of the city's children have tested positive for elevated lead levels after city officials cut corners to find a cheaper source of water. So what's happening in the short and long-terms to find a solution for Flint? 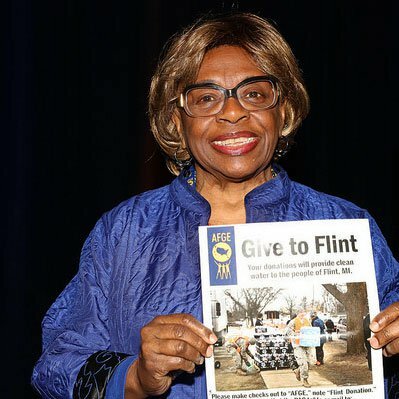 AFGE members raised enough money to buy 36,000 bottles of clean water for Flint during the 2016 Legislative & Grassroots Mobilization Conference in Washington, D.C. Those efforts built upon the work started by AFGE members in Michigan, particularly Locals 1262 and 3272, who have gone above and beyond to help high-risk Flint families. Over the President's Day holiday, National President J. David Cox, Sr., National Secretary-Treasurer Eugene Hudson, Jr., and District 7 National Vice President Dorothy James and AFGE members from the Environmental Protection Agency (EPA), Department of Defense, Border Patrol, Social Security Administration and the Department of Veterans Affairs joined parishioners from the Shiloh Baptist Church to distribute the water. It was cold, but everyone helped out. 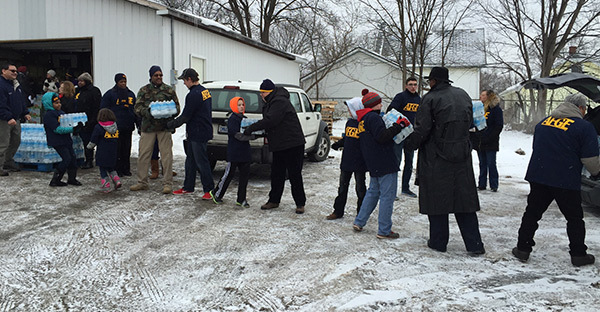 AFGE locals and other Michigan unions have stepped up for Flint residents. Union plumbers and pipe fitters from across the country came to Flint to replace the defective lead piping systems for free. Labor has also partnered with the Rainbow PUSH Coalition to hold a special "Rebuild Flint" demonstration event on Feb. 19, 2016. Our brothers and sisters from AFSCME, the American Federation of Teachers, Carpenters & Millwrights, Laborers, the NFL Alumni Association and UAW-GM will stand shoulder-to-shoulder with Flint residents during the event. After distributing the water to local families, NAACP President Cornell Brooks held a press conference in AFGE leaders in attendance. Brooks called on the city to fix the water crisis within 30 days. He said that if the problems continued any longer, the NAACP would take action in the form of civil disobedience. U.S. Senator Gary Peters praised the AFGE's fundraising and advocacy and called for a permanent solution. "These volunteers are critical," he said. "But the important thing to remember is that this can't continue. People can't live on bottled water. You can't shower, you can't bathe, it's hard to cook. This is not a way to live." AFGE is pressuring Congress to give more funding to the EPA — a move that AFGE National President J. David Cox says is crucial to fixing the root cause of the lead poisoning. "Our working men and women at the Environmental Protection Agency are the best defense against this sort of widespread contamination happening, but they need the funding to do it. We must give our researchers and scientists the resources they need to hold the city of Flint accountable for fixing this problem, and to make sure it never happens again." 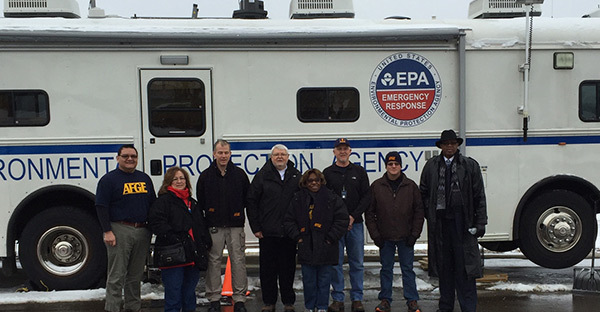 Before distributing water, President Cox along with NST Hudson, and NVP James visited the EPA’s Command Center for a tour and discussion of our members' environmental efforts in Flint. Every day we know that there threats to cut more of the vital services Americans need to stay healthy and safe. But we also know there are over 300,0000 AFGE members are working to protect communities and families. And we aren't going to stop working for a better nation. Want to help Flint? Here's how.